So last night was the last ever, Bad Reputation. 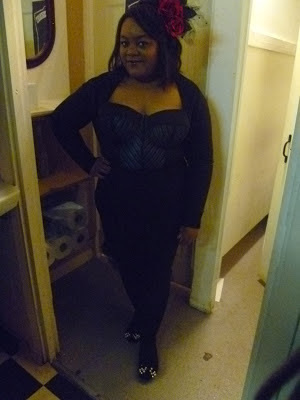 I wanted to change my look a little, so decided to go all Black, booby and tight! 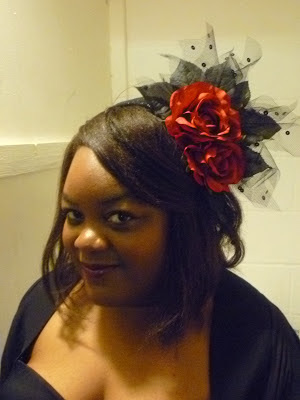 I accessorised with a pop of colour in the form of red lipstick and the most wonderful headpiece from Pearls and Swine. I have had this headpiece for the longest time, and until last night, couldn’t find an opportunity to wear it. This bodysuit was so comfy! I’m a loser, so was far too scared to go up to the Bad Rep team and thank them. Thank them for creating a safe environment for people like us to meet, have fun and dance with sheer abandon (the only way anyone should ever dance). It’s so important we have more events like this; we ironically live in a “modern” society where people like us: the queers, geeks (to which I am a proud one! ), misfits and fats (me again!) are looked upon with distain and constantly misunderstood. Having a place where we can support and encourage each other is exactly what Bad Reputation is/was- this will be their legacy and they did themselves proud! Can’t wait to see what they do next. Also, many thanks to them for the wonderful gifts of a mixed CD and Zine- too kind! I love that headpiece on you. You are just so beautiful. I really like the latest post. I really started my site as a catharsis of sorts and strange enough, I started believing all the fat activists and bloggers that said to just live your life as you are now. Don't wait to lose that 20, 30 and 40 pounds.